Ittefaq Hospital (TRUST) Lahore Punjab. Selected Candidates will be offered handsome salary package & other benefits including EOBI, Casual/Earned Leaves, annual increments and career development opportunities. Send Your CV Email. 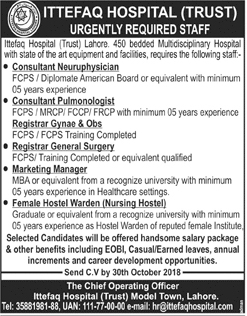 hr@ittfaqhospital.com latest by October 30, 2018. Ittefaq Hospital (TRUST) Model Town, Lahore.